Bad breath can affect people of all ages, but certain age-related conditions make people over 65 more susceptible to developing halitosis. However, it’s possible for seniors to combat this condition, and it doesn’t necessarily have to take a lot of work. 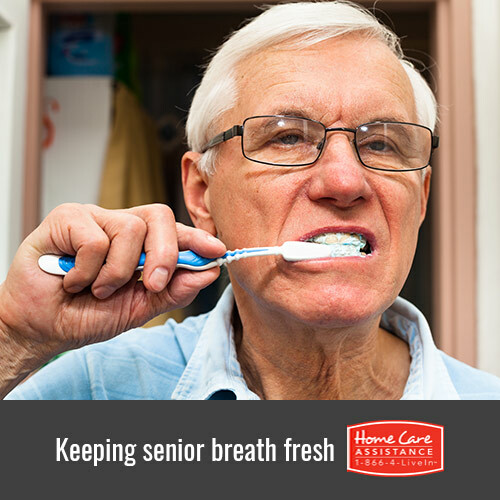 The Harrisburg elderly care professionals at Home Care Assistance have a few simple tips to help keep your elderly loved one’s breath fresh. Also called xerostomia, chronic dry mouth is listed as a side effect of over 500 different forms of prescription medication. When this medical issue remains untreated, there is a very high chance it will eventually cause halitosis. If your loved one has bad breath, encourage him or her to speak with the doctor to see if prescriptions might be causing the halitosis. Dexterity issues such as osteoarthritis can make brushing and flossing more difficult. However, a variety of companies offer toothbrushes, tongue scrapers, and flossing sticks designed specifically for older adults who have conditions affecting movement in their hands and wrists. Many of these products have larger handles to help seniors get a better grip, and upgrading to an electronic toothbrush is another option if your loved one finds it difficult to move his or her hands back and forth. Caring for dentures and other removable dental devices often involves quite a bit of work, and older adults sometimes forget to complete these tasks first thing in the morning or before heading to bed. Creating a checklist to keep in the bathroom or on the nightstand can remind your loved one to rinse his or her dentures and clean his or her gums. Seniors who do not keep their dentures clean often develop bacterial infections that cause tooth decay, gum disease, and bad breath. Regularly using mouthwash is another simple way for your loved one to kill off some of the bacteria that cause bad breath. As a general rule, mouthwash should be swirled around the mouth for at least 30 seconds after brushing and flossing. Alcohol-free mouthwash is often considered a suitable option for seniors because alcohol is a drying agent that can increase the risk of xerostomia. If your loved one needs help maintaining good dental hygiene, reach out to Harrisburg Home Care Assistance. Our expertly trained caregivers can assist with various grooming tasks, provide transportation to dentist appointments, and help with a wide array of other everyday activities. For more information on the respite and 24-hour care Harrisburg, PA, families trust, call one of our experienced Care Managers at (717) 540-4663 to schedule a free in-home consultation.